All the major indices finished slightly down on a week as also anticipated by last week’s market review. Accompanied with relatively low volatility the stock markets found their nearest support levels in an attempt to consolidate for possible bigger move in forthcoming weeks. Last Friday trading session recorded very heavy volume. This is an important sign of market positioning at the support levels, which means that investors got a strong interest in stock ownership before a possible bounce upwards. Federal Reserve with fresh assignee Jerome Powell is going to announce a short-term interest rate increase from 1.5% to 1.75% this week. The rise is more-less considered as a done thing by a market and thus, if not announced otherwise, the stocks shall continue rising within an established trend. There are 2 or 3 more hikes expected this year. Jerome will outline the overview of next increases and thus, these events are the most watched by all market participants. 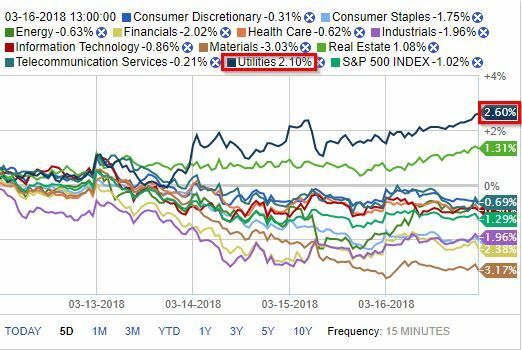 While the stock market finished slightly lower last week, Utilities and Real Estate industries ended in positive territory. An interesting fact is that Utilities segment outperformed the market by 2.6% as depicted below. This is a good signal for traders to look for good quality stocks in the industry. This week may provide great entry opportunities followed by substantial gains! S&P started its week by reflecting from its long-term resistance (wide brown line) landing on its support 50 SMA. High volume holds the stocks at this level. Dow keeps moving within the trend lines of the triangle pattern. 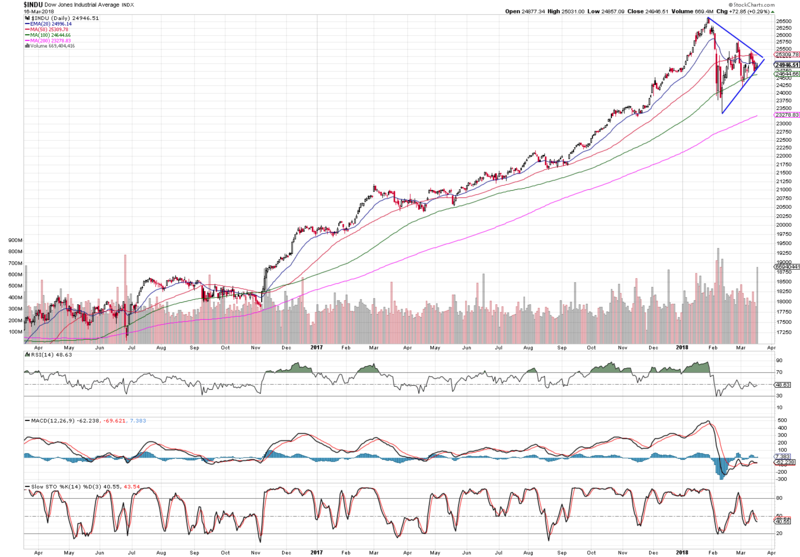 The pattern should complete this week – piercing through the 50 SMA will signal a positive outlook for the index. A top performing index is eliminating its bearish divergence as signaled in last week market review. 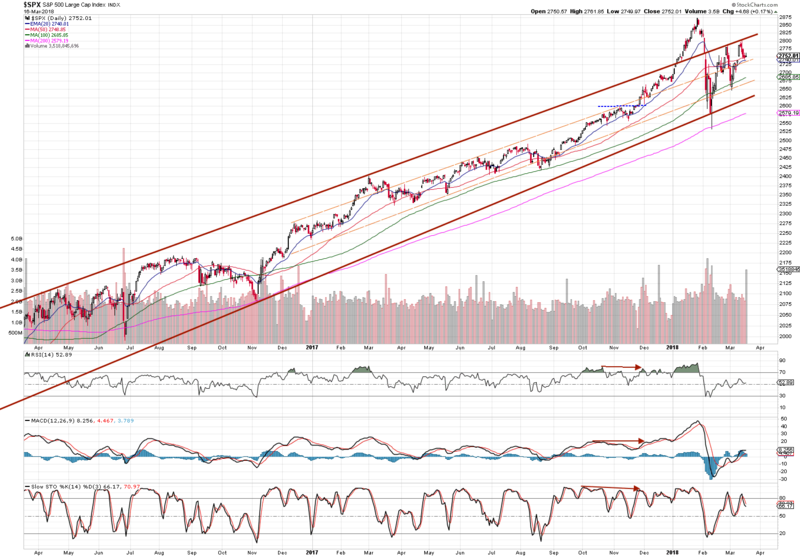 At the moment it is sitting on the long term-resistance (wide brown line), which was broken twice in recent months. If good news from Fed don’t come earlier, this market most likely bounces from its 20 EMA support level. 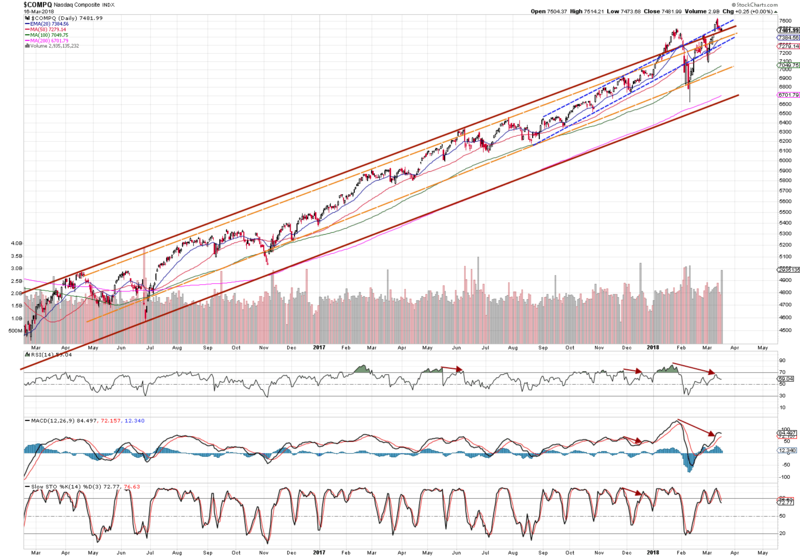 Nasdaq has been developing a tight bull trend channel (blue dashed lines) since September last year. The UK market keeps stagnating, although it has also recorded above the average trading volume. A break through short-term resistance should bring the market higher. While the current market review has a positive outlook, everybody is awaiting Fed’s announcement this week and thus, the successful traders will behave cautiously until the event. Let’s not make premature decisions, instead, let’s stay disciplined and focused on big trend!